Casie Marie Darnell didn’t come from Jacksonville, although she’s not new to the feeling of living in a small town. Darnell was raised in New Lenox, a town about the same size of Jacksonville and, in case you were wondering, just outside of Joliet. Darnell also spent some time in Florida after finishing up her time at Northern Illinois University (NIU). In the end, it was love that brought Darnell to Jacksonville; her husband, Joe Darnell, was born and raised here, which helped them make the decision of where to put down roots. Once here, Casie Marie Darnell began her job search – and three years ago, she was introduced to an opportunity at the Morgan County Health Department through a friend. The rest is history. 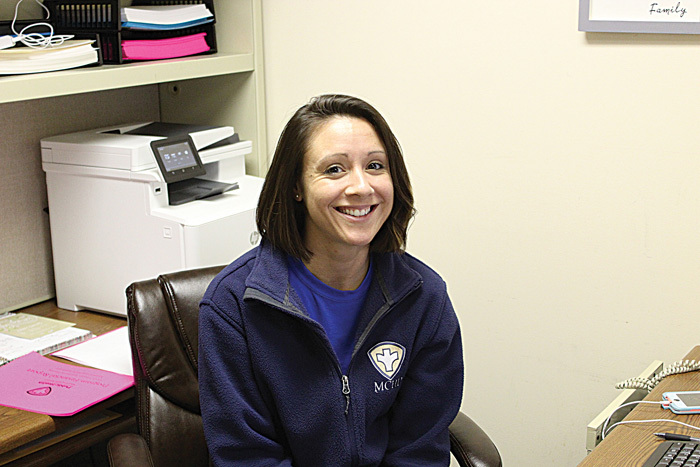 She’s now the fiscal manager and administrative assistant for the Morgan County Health Department and absolutely loves her job. When she’s not there though, Darnell is spending time with her family: her two hilarious daughters, Camille and Mila; her husband and best friend Joe; and their two dogs and cat. Together, Darnell and her husband help teach their daughters about tolerance through baseball, with Casie Marie Darnell being a Cubs fan and her husband being a Cardinals fan. If she has any extra time after work and family, Darnell is probably training at her local CrossFit gym where her husband is a coach, or volunteering her time at church. Volunteering is a passion for Darnell, so much so that when asked what she would do if monetary issues were no longer important, Darnell said that she would love to volunteer more at First Christian Church since it has become such a big part of their lives. When discussing super powers though, Darnell decided to color outside of the box and tossed away the concept of conventional powers, opting to have her power be to bring all members of The Beatles dead and alive back together. If you’re out and about, stop by the Morgan County Health Department and tell Casie hi.